Watch HairLuxe at work in our videos and it’ll seem like magic. Go outside in the wind, get caught in the rain, or just lay your head down on a couch or pillow and, suddenly, that pesky, shiny bald spot is showing again. Why? Because the products simply fell out. They couldn’t hold up to the rigours of everyday life. We use the raw material called Moroccan Gossypium Herbaceum. The fibres extracted from the plant, which are almost identical to your hair, bond to your hair through a strong static charge. 1. Thickening your existing hair to amplify your hair volume and making the scalp invisible. 2. Colouring the exposed scalp to match your hair color. 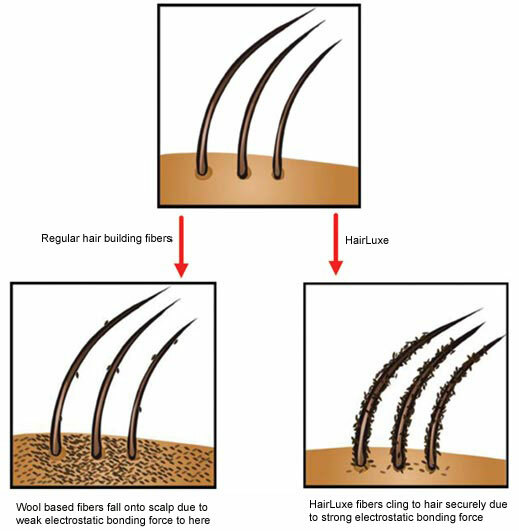 This technique does hide the scalp in thinning areas, but does not increase hair volume. Experienced theatrical and Hollywood makeup artists will tell you that the first approach, thickening existing hair, gives the most natural appearance. The second approach hides the scalp, obviously, but produces a dull, unnatural look. Since the HairLuxe hair loss treatment bonds to your hair securely, working with science instead of against it, HairLuxe will thicken your hair shafts and amplify your hair volume. That will give you a fuller, natural looking head of hair, not a spray-painted scalp. 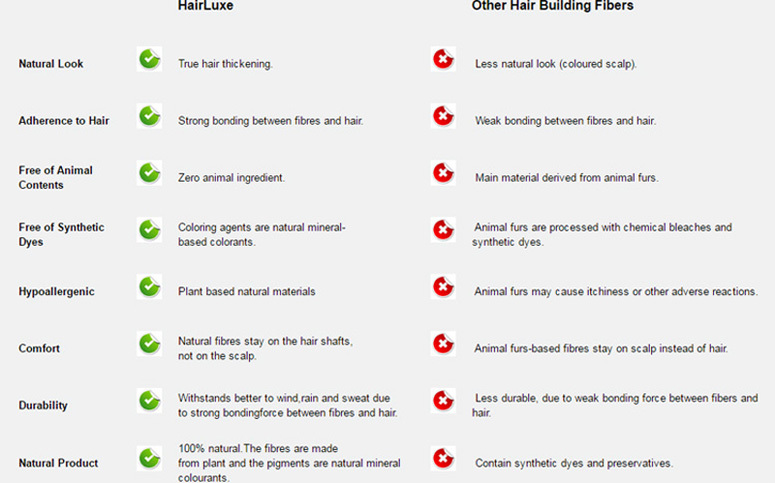 In contrast, HairLuxe uses completely natural ingredients: plant based fibres and natural mineral colourants.